4 Ways Seventh Sojourn Can Help You Meet New Year’s Resolutions — Seventh Sojourn Soaps, Inc.
New Year’s Resolutions often include health-related goals. You may have committed yourself to eating healthier, working out more, or finding ways to de-stress. These common goals often require creative solutions or changes to your routine. And no—we are not recommending that you add soap to your morning tea, nor are we suggesting that you throw 50 bars of soap into a pillowcase to fashion a great-smelling dumbbell to get that perfectly sculpted bod you’re hoping for. On the contrary, Seventh Sojourn wants to help you discover beneficial resolutions that you may have overlooked, and products to help you along the way! 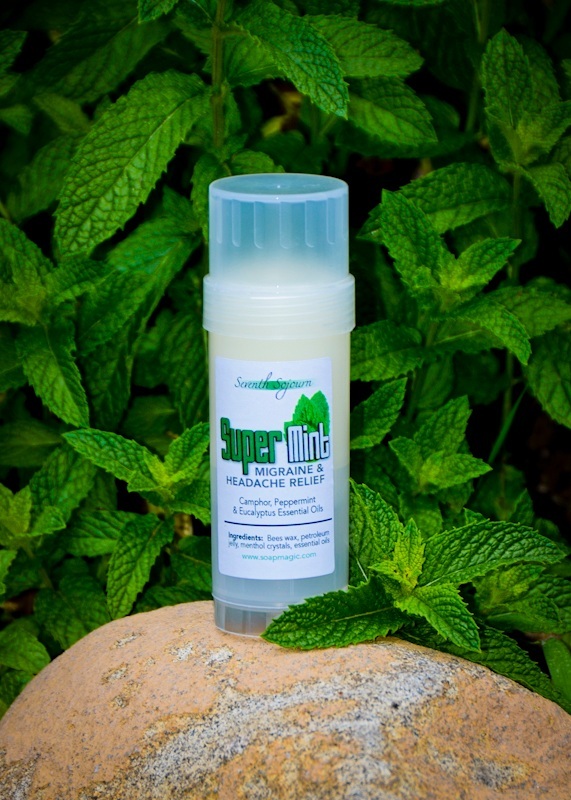 SuperMint topical gel is handmade with a collection of all-natural ingredients including beeswax, shea butter, menthol crystals, petroleum jelly, and essential oils. The essential oils are designed to penetrate the nerve cluster that causes the tension and pain. Seventh Sojourn recommends applying SuperMint to the base of your neck in an “x” or “t” pattern. Personally, I also apply it to my temples and get great relief. All feedback on SuperMint has been outstanding thus far! Order SuperMint today, and say farewell to long-lasting headaches for good. Acne is like the clueless guy who just doesn’t get that you’re not interested. It hangs around, embarrasses you, makes you uncomfortable, and outstays its welcome. For 20 years, Seventh Sojourn Soaps have defended against acne for countless customers who were in search of a natural and reliable remedy. My own personal testament can be found here, along with some other helpful practices to ward off acne. What is the Soap secret? · Big-box soaps are full of harmful additives that are used to keep the cost of production down. Unfortunately, the deal you are getting on the price does not help with clearing your skin. Dry and irritated skin are common consequences of using mass-produced soap, which only worsens acne problems. · Big-box soap makers extract glycerin (the most important component of soap) to cut costs on other products like shampoos and conditioners. Glycerin is considered the “moisturizer” in soap and the big box soapers are robbing you of this important ingredient. If you are looking for a great product that will moisturize and clear your skin, look no further than Seventh Sojourn. Some of our popular blends for acne sufferers are: Unscented, Grapefruit, Oatmeal Milk & Honey, Cleansing Tea Tree, and Eucalyptus. These blends will help you get a head start on warding off acne in 2019. So many of us go about our days suffering through familiar aches and pains. We try to ignore it, fight through it, and just generally leave it untreated. We become accustomed to taking the daily dose of ibuprofen or aspirin, even if they just offer temporary relief. Spicy Ice was designed by Seventh Sojourn to replicate the “heat to ice” treatments generally recommended for sore muscles and joints. The warm sensation can help muscles relax while the cool sensation can help reduce swelling. There is no chili oil or capsaicin in this product. We use a ton of essential oils including Cinnamon, Clove, and Camphor. Spicy Ice has also gotten all positive reviews thus far! Put your sore muscle problem on ice and order Spicy Ice today! O.k., I’m about to go full-hippie on you here for a paragraph, so bear with me. Aromatherapy is a holistic approach to healing a multitude of health issues that can be a complete drag, man. This approach to healing those “buzz killing” health issues has been around for literally thousands of years. Ancient cultures in China, India, and Egypt were the first documented people to use these “groovy” treatment using resins, balms, and oils. Seventh Sojourn uses essential oils that are major staples to the aromatherapy experience. In fact, essential oils are the most important ingredient in SuperMint (headaches) and Spicy Ice (aches and pains), which have been lauded for their effectiveness. · Grapefruit – helps with acne, colds, depression, fatigue, hangovers, headaches, and jet lag. · Eucalyptus – Overall skin health, hair care, antiseptic, cold, flu, respiratory, congestion, muscle and nerve pain, stress relief, and bug repellent. · Lavender – Promotes wound healing, neuroprotective, stress relief, respiratory, sleep assistance, anti-bacterial, acne, hair care, pain relief, bug repellent, stimulates urine flow, circulation, digestion, eczema. · Spearmint & Peppermint – helps with stomach problems, respiratory issues, pain relief, herpes relief, hair and skin health, stress relief, nervous system functioning. As you probably know, Seventh Sojourn provides a large selection of products that contain these wonderful essential oils. Take a look around our website and choose an essential oil product that suits your needs the most. Your life should be busy with fun, new and exciting adventures and free of pains, ailments, and stressors. Seventh Sojourn was founded on a firm goal to improve the lives of our customers so you can kick these ailments in the behind and indulge a little in the process. Since we travel to Renaissance Festivals and craft shows, we get to know many of you, and naturally develop friendships with a sense of caring that motivates us to bring you lovingly crafted products. It is our hope that you use these products to drastically improve your life in 2019. Disclaimer: Please note, this post is not a claim that these products and oils can cure these issues. And, as always, Seventh Sojourn recommends you visit your Dr. or Dermatologist before you use any of these products to ensure they are right for you.